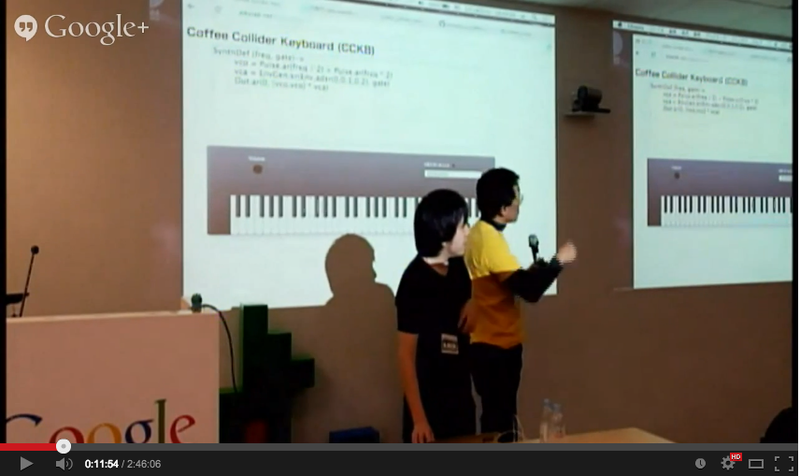 On January 18th 2014, Google cooperated with a community Web Music Developers JP and held the second Web Music Hackathon at Google Tokyo office. and build something within a day. 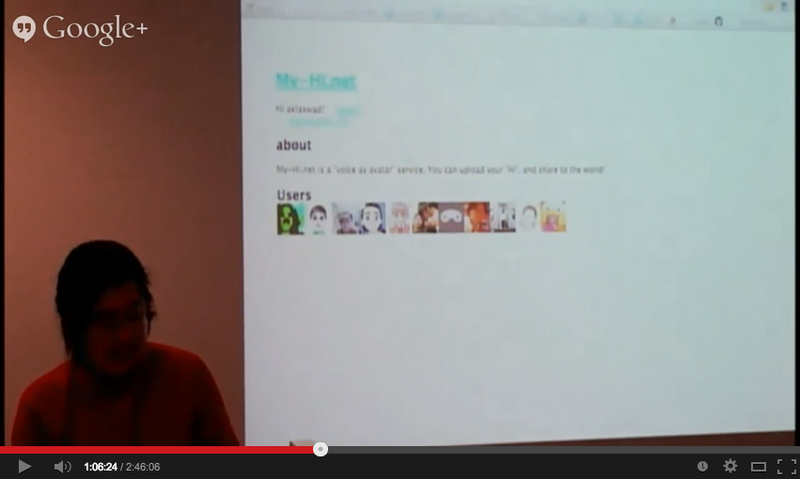 The first hackathon was a blast with quite a few fantastic apps built. Read details on this blog article (in Japanese). This hackthon again, was with cooperation from AMEI (Association of Musical Electronics Industry), YAMAHA, Korg, Roland and Crimson Technology brought instruments to hack on, as well as NTT Communications brought equipments to make WebRTC environment easier. The demo Mr. Watanabe from Roland shows off at the beginning of the event represented the potential of this area quite well. It turned out we had 30+ attendees with many observers from each instrument manufactures etc, 60+ people packed in the venue. Hack started before noon, finished around half past 4 PM then we moved to the demo time. More than 20 fantastic works were done. There's a video recording available online. You can watch it along with other photos and comments at Google+ event. 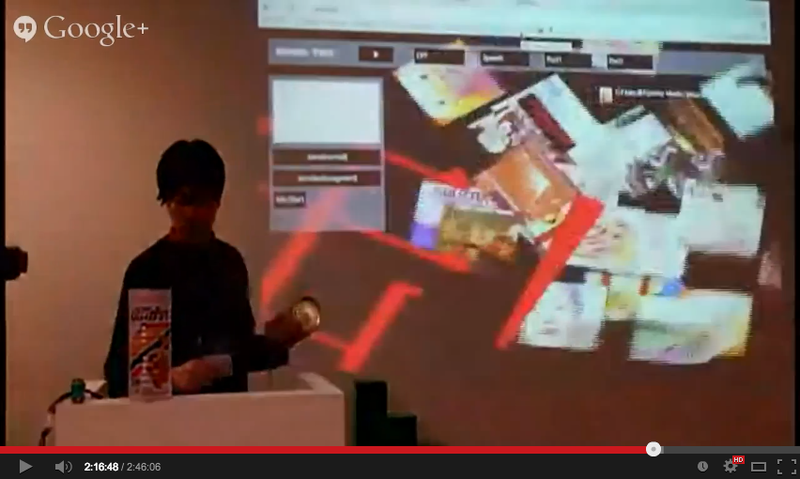 I've picked up several notable presentations here since the video is very long lasting nearly 3 hours. Each photos are linked to relevant starting time of the video. A browser keyboard utilizing @mohayonao's CoffeeCollider. Your code in the form is recognized in realtime. Leave 2 second message associated with your Twitter account at My-hi.net. You can listen to others' voice by hovering cursor over Twitter icons. "MIDIappy" is a mascot character designed by gaito a.k.a g200kg. 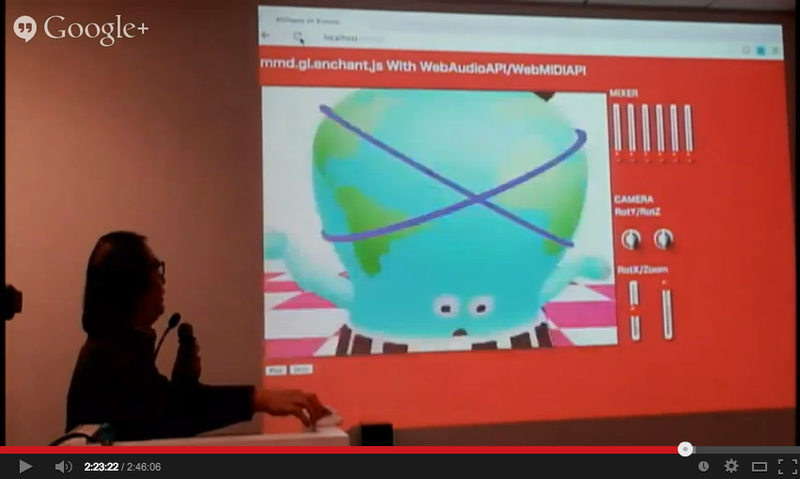 He made it dance as a 3D modeled figure on WebGL and controllable using a MIDI controller. 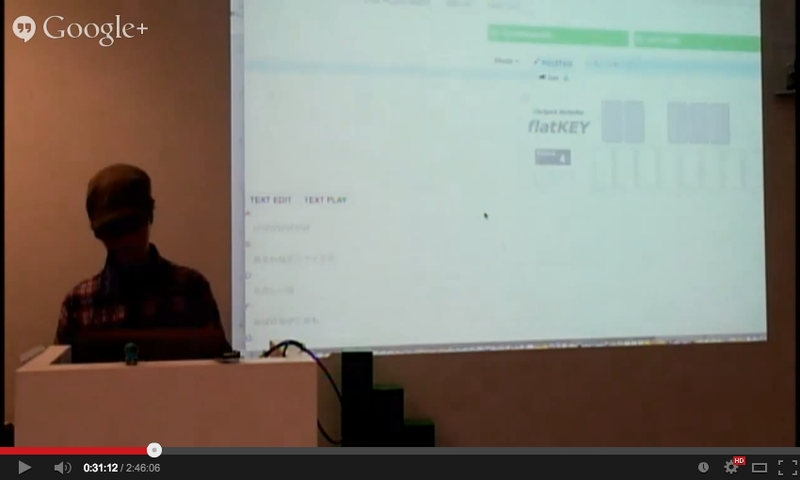 The most flashy demo at this hackathon was this one. 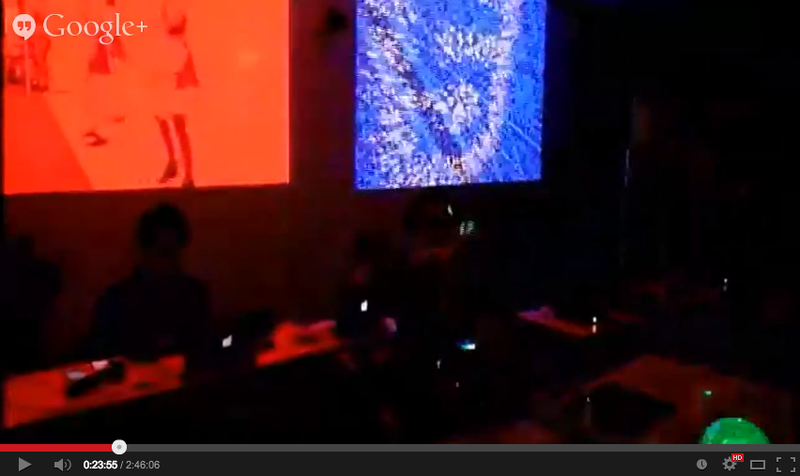 Multiple demos together including a Leap Motion controllable mirror ball via DMX, a visual effects demo using WebRTC, WebGL with music analysis + MIDI controller, etc. This one got the second prize. 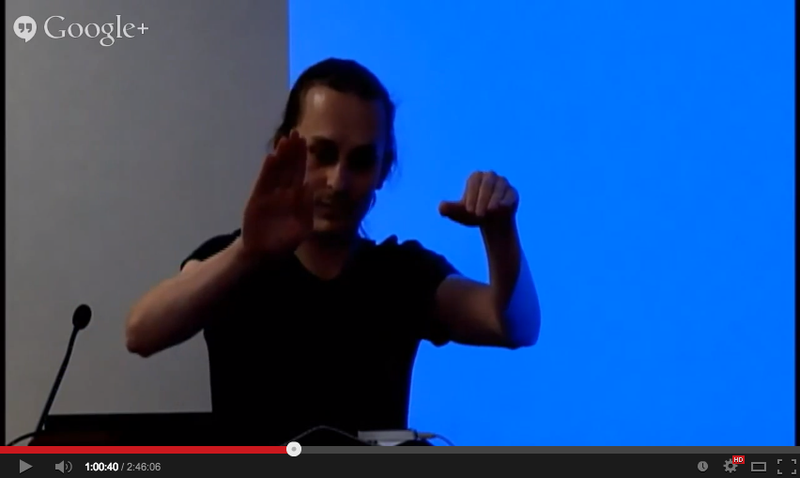 The presenter played music using gesture over Leap Motion and visualized the sound to touch pads on Ableton Push. Check out his fancy gesture. 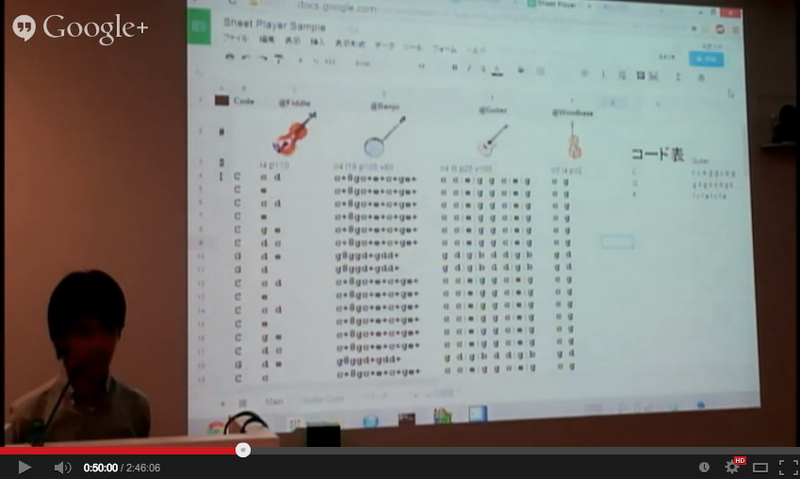 The winner of the hackathon was a music sequencer using Google Spreadsheet + Chrome Extension. It's amazing to see how effective to use spreadsheet as a sequencer platform. Note that the referencing feature of spreadsheet is used to represent chords. Actually, half of attendees at this hackathon had attended the last one as well. I can tell because it was so much fun! Unfortunately I missed the after party but this one was also a great event. I'm hoping we can continue holding this event and gradually shift our focus on something more musical rather than sound oriented. If you are interested in this event, please subscribe to our mailing list or join Google+ community. Ryoya Kawai who is the main organizer of this event will give you updates. We're looking forward to your attendance.